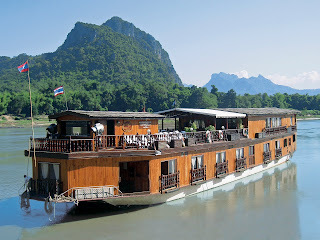 APT has added Thailand land touring and cruising the Upper Mekong in Laos to its Vietnam holidays. Upper Mekong cruising will be on the stylish boutique river ship Mekong Sun (pictured), carrying up to 28 passengers. Thailand land touring includes two nights in each of Chiang Mai, Chiang Rai and Bangkok. Three APT itineraries combine the six-day Upper Mekong cruise which starts and finishes in Luang Prabang with Vietnam and Cambodian land touring and Lower Mekong cruising (from $11,495 per person twin share) where APT operates La Marguerite and ms AmaLotus. APT has fly free offers including taxes for the 26-day Vietnam, Cambodia, Laos & Thailand Discovery package (from $11,495 per person twin share) departing between November 2011 and April 2012, and on the 21-day Vietnam, Cambodia, Thailand Adventure (from $9295). The deals apply to bookings before September 30, 2011. A $2000 deposit for a fly free offer is due within seven days of booking. The 18-day Vietnam, Cambodia & Thailand Adventure, from $8195 is billed by APT as the lead-in package. The price includes Ho Chi Minh City, seven-night Mekong cruise, port charges and tipping, 52 meals including Dine Around Dinners, soft drink, local beer and spirits available at all times on the Lower Mekong cruise, small boat excursions to the floating markets in Cai Be, Vinh Long and Sa Dec and on to Siem Reap and its Angkor temples, then to Chiang Mail and Chiang Rai in Northern Thailand, the old kingdom of Chian Sean and to Bangkok and its palaces and temples.